A Volkswagen board member is threatening to withhold future investments in its Tennessee facility if the workers do not unionize, according to Reuters. Osterloh’s comments come just days after workers at the Tennessee plant voted overwhelmingly against unionization efforts by the United Auto Workers. The United States prohibits company management from intimidating workers during organization campaigns. What makes VW unique is that the law was designed to prevent employers from pressuring workers to vote against the union, not for it. 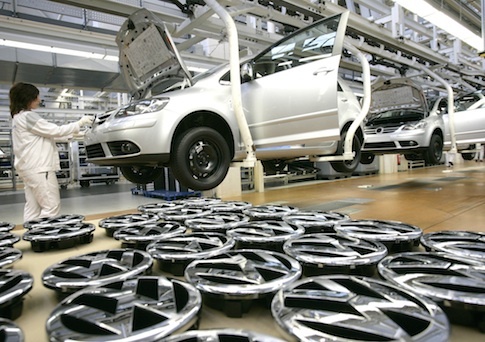 Glenn Taubmann, a lawyer with the National Right to Work Legal Defense Foundation, filed a complaint alleging pro-union intimidation during the UAW’s campaign, though the German auto union, IG Metall, denied they were making such threats. Taubmann said that Osterloh’s most recent comments confirmed those suspicions. "This is what’s been going on all along. The threats were the IG Metall way of trying to pressure workers," he said. " It comes very close to crossing the line [of illegality], if not directly crossing it." This entry was posted in Issues and tagged UAW, Unions. Bookmark the permalink.